3D printing has proven to be an efficient manufacturing method for complex, customised and light structures. In addition to thermoplastics, 3D printing materials include metals, ceramics and foodstuffs. The range of biomaterials in 3D paste printing is still fairly limited, since pastes pose unique challenges: their structure must not collapse during printing and the objects manufactured must remain sufficiently strong, rigid or flexible after drying. In 3D biomaterial filaments, however, commercial products already exist. Cellulose nanofibrils offer an opportunity for developing durable, bio-based commercial 3D-printing materials. They can offer an alternative to the currently used chemicals, such as resins, synthetic thickeners, strengtheners and plastics, the use of which might generate harmful emissions and even allergising compounds. Nanocellulose is an attractive option for medical applications, for example as a carrier of drug molecules. VTT is currently developing a solution where a protein attached to a 3D-printed adhesive bandage can help to promote the growth of skin cells around a wound. The purpose is to have the healed wound area remain flexible instead of it developing stiff scar tissue. The development is done in collaboration with the University of Tampere and funded by The Academy of Finland under the BioDisp3D programme. The same materials development process can also be used in the cosmetics industry or in the manufacture of artificial bone, for example. 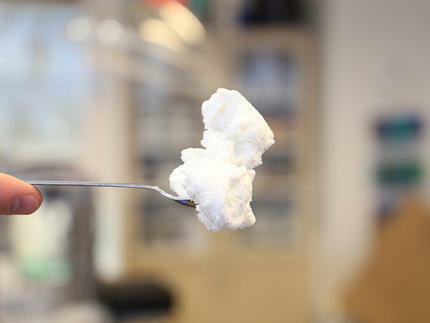 “By using nanocellulose, we have succeeded in creating 3D structures that absorb liquids three times more efficiently than the compared alginate fibre dressings commonly used in wound care,” says Senior Scientist Panu Lahtinen from VTT. VTT's wound care prototype combines nanocellulose, a protein used in wound care, and printed electronics measuring wound healing into a single product. The measurement electrodes were printed with silver ink onto a film made of polyurethane-nanocellulose, with the electrodes providing connection points for the wireless FlexNode reader developed at VTT. The electrodes are protected by another laminated layer of the film. On top of this lamination lies a 3D-printed wound care gel containing nanocellulose, alginate and glycerol as the active ingredients. The FlexNode reader transmits temperature or bioimpedance data from the wound wirelessly to a computer used by the health care team. The reader can be connected to the wound and attached to the patient with gauze. Nanocellulose has not yet been approved for medical use, which means that it will take several years before this application is used in hospitals. VTT is also developing bio-based printing materials for modifying textiles, mock-ups, indoor decoration elements and therapy applications in wound care under the DWoc and NoMA projects funded by Tekes - the Finnish Funding Agency for Innovation. By selecting appropriate combinations of materials, it is possible to print both flexible and rigid structures, depending on the need. Product properties can also be customised by other means. Nanocellulose increases the opportunities for creating new surface patters in decorative elements. The development still requires light and moisture tests in various applications. Printing materials can also be used for 3D-printing customised moulds. Manufactured for example from cellulose or the side streams of agricultural or food production, Cellulose nanofibrils (CNF) are suitable for 3D printing pastes thanks to their mechanical strength, effects on viscosity and biodegradability. In particular, CNFs can be used for improving the rigidity of 3D-structures. The way the fibrils are cross-linked affects the properties of the structure: moisture tolerance, rigidity and flexibility. Due to the excellent water absorption capacity of CNFs, printing pastes can be made viscous enough for the 3D printing process. A 3D printing paste can contain up to 50% of water without the paste running during printing. VTT has used CNFs to develop flexible, rigid and porous structures. Manufacturing a flexible structure out of bio-based materials is challenging, since the object tends to harden and become more rigid as it dries.